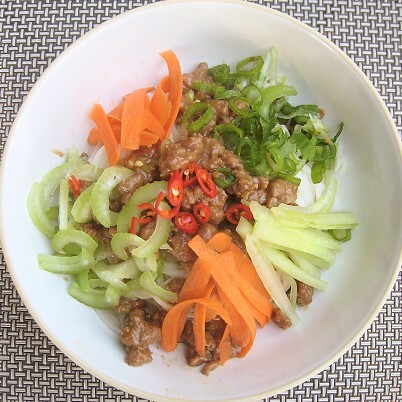 Another day, another ground pork dish. On the days my mother goes grocery shopping, she always brings so much ground pork back. Sometimes, she brings back 8 pounds of ground pork intended for the next couple of days! Not being the ground pork specialist, I often wonder whatever shall I cook with this much ground pork. 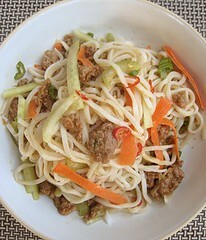 I've been craving some dandan noodles lately, so I thought, why not add some ground pork to the sauce? All the dan dan noodles I've ever had previously usually had a meatless sauce. To start, I had to roast a couple of tablespoons of Sichuan peppercorns. After being sufficiently roasted (its fragrance should waft up your nose), they were ground into not-so-fine powder. First, some oil into the wok. I had minced some ginger and garlic and they went in. Then the shallots. When fragrant, I threw in the ground pork and tried to break the mass up. For more aroma and body, I added a tablespoon of Shaoxing wine. In went soy sauce, brown sugar, the Sichuan peppercorns, and five-spice powder. For the "nutty" component, I suppose one could use either peanut butter or sesame paste. Peanut butter was handier for me, so I chose to go with that this time. I added a bit of water to loosen the sauce and the whole dish was finished with a drizzle of sesame oil. 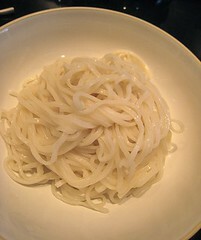 I had some plain wheat noodles boiled and ready to go. Spaghetti would be a substitute for this. 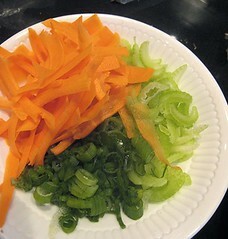 For the garnishes, I shaved some carrots, sliced some cucumbers, and added a bit of celery and green onions. I had hoped to add some peanuts but all we had were horrible cocktail peanuts so I nixed the idea. I wasn't in the mood to do a chili oil and we didn't have any on hand so I decided to forego it and just added some Tabasco to my own bowl of noodles. I also chopped a few chile peppers for garnish. 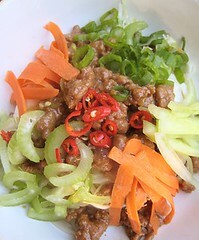 For the blog, TS arranged the pork sauce and the garnishes artfully on top of the noodles. I liked this: the sauce was rich and nutty, the noodles toothsome, and the garnishes had a pleasant cooling effect. If ever, I would have liked this a tad more garlicky and a tad spicier. Toast the Sichuan peppercorns in a dry pan until their fragrance wafts up your nose. Let them cool a little, then grind in a spice grinder. They don't need to be too fine. Heat a wok over medium-high heat. Add oil. When the oil is hot, add the ginger and garlic, then the shallots. 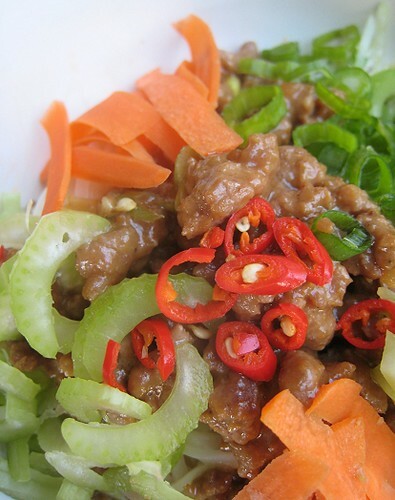 When fragrant, about 30 to 60 seconds, add the ground pork, trying to break up the mass. Add the Shaoxing wine, soy sauce, brown sugar, five-spice powder, and the ground Sichuan peppercorns. When the ground pork is fully cooked, add the peanut butter or tahini. Stir and mix well. The peanut butter or tahini will thicken the mixture, so add water if necessary to loosen the sauce. You may need to adjust the seasoning too at this point (saltiness, sweetness, spices). The sauce can be kept warm over low heat, covered, while the noodles are cooked and/or the garnishes prepared. Add the sesame oil at the last moment. Boil the wheat noodles or spaghetti according to the manufacturer's directions, taking care to pull out the noodles and drain when they're al dente (not too soft). 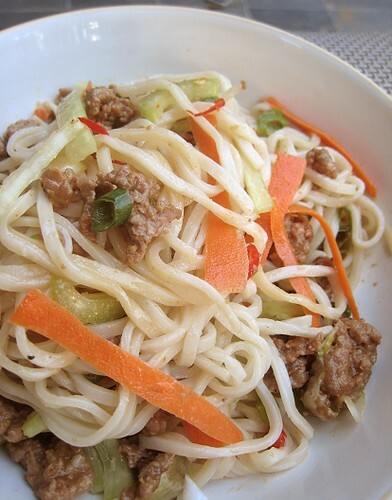 Either in each individual serving or a large platter, place noodles at the bottom, then top with ground pork sauce and the garnishes. Enjoy! Amazing and so beautifully done. I love how colorful this is and the addition of pork looks wonderful! They look like real dan dan noodles to me. The version I had in a restaurant had ground meat, Sichuan peppercorns, and peanut butter. This looks wonderful! I love ground pork. That looks extremely good.I am going to have to make this. . . soon. I made dan dan noodles a while ago and it was really good. I used the ground pork in mine as well. I'm like your Mama, I buy ground pork every week and I'm always trying to come up with new ways to cook it also! We're quite confused because we've had "dandan" noodles with soup, sometimes without soup; other times with peanuts, other times with just a bean sauce thing... Who knows! Ground pork is a very Chinese ingredients, hehe. We should go check yours out.